The 2013 Broadway hit Motown The Musical is playing at London's Shaftesbury Theatre . With just $800 which he borrowed from his family, Motown founder Berry Gordy, became a music mogul, discovering and launching the careers of motown royalty including Diana Ross and the Supremes, Michael Jackson and the Jackson 5, Stevie Wonder, Smokey Robinson and the Miracles, Marvin Gaye . 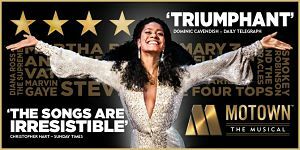 Motown The Musical uncovers the story of the legendary record label that changed music history and created the soundtrack of a generation.Featuring an eighteen piece orchestra playing 50 Motown tracks including “My Girl”, “Dancing In The Street”, “Ain’t No Mountain High Enough” and “I Heard It Through The Grapevine”. The cast is led by Jay Perry as Berry Gordy. He is joined by Natalie Kassanga as Diana Ross and Carl Spencer as Marvin Gaye qith David Albury as Smokey Robinson. 11 year-old Cruz Lee-Ojo shares the role of Young Michael Jackson, Berry Gordy and Stevie Wonder with 12 year-old Tumo Reetsang. They are joined by ensemble members who play he role of Eddie Kendricks, Jackie Wilson, Anna Gordy, Esther, Teena Marie, Florence Ballard, Martha Reeves, Tito Jackson, Jermaine Jackson, Mary Wells, Mary Wilson and Stevie Wonder: Chanice Alexandra-Burnett, KM Drew Boateng, Timothy Benjamin, Ryan Carter, Ricardo Castro, Amandla Elynah, Livvy Evans, Segun Fawole, Angela Marie Hurst, Cameron Bernard Jones, Cleopatra Joseph, Duane Lamonte, Nathan Lorainey-Dineen, Mireia Mambo, Matt Overfield, Adam Philpott, Ainsley Hall Ricketts, Lawrence Rowe, Nate Simpson, Jaime Tait, Kyle Turner, Anna Van Ruiten, Cherelle Williams, Lashane Williams, Michael Woolston-Thomas, Jayme-Lee Zanoncelli and Mitchell Zhangazha.